Traditional Taiwanese breakfast, Zhī Shān district (芝山區) near Rock’s grandparent’s place. Feast. 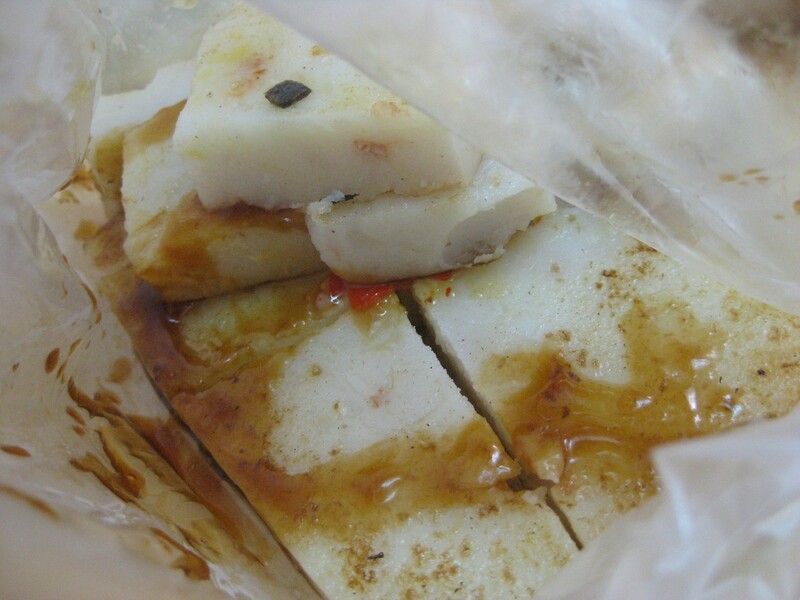 Turnip/Daikon cake (蘿蔔糕, luó bo gāo). 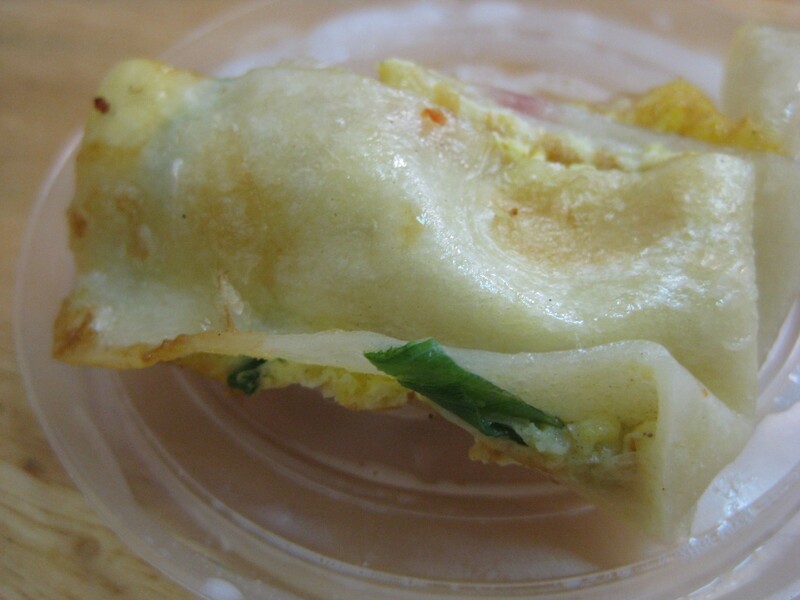 Egg crepe (蛋餅, dàn bĭng). 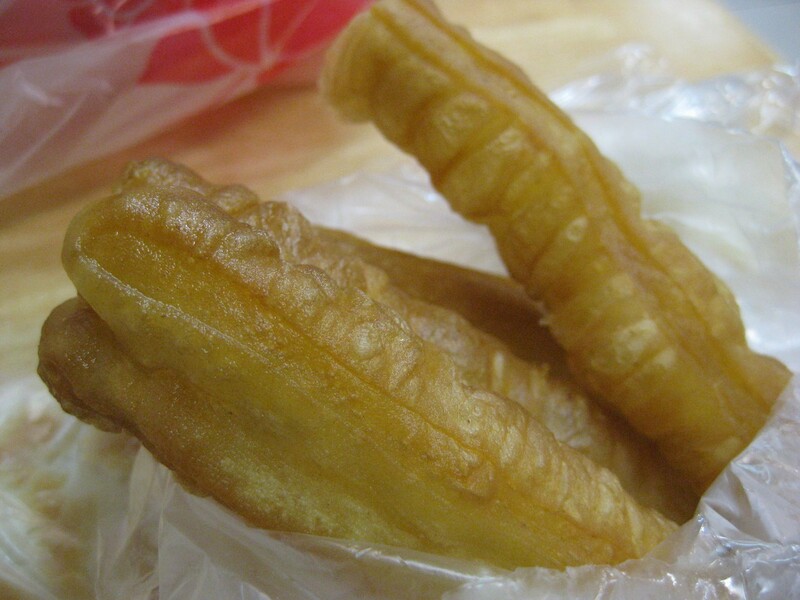 Crullers (油條, yóu tiáo) a.k.a oil stick). 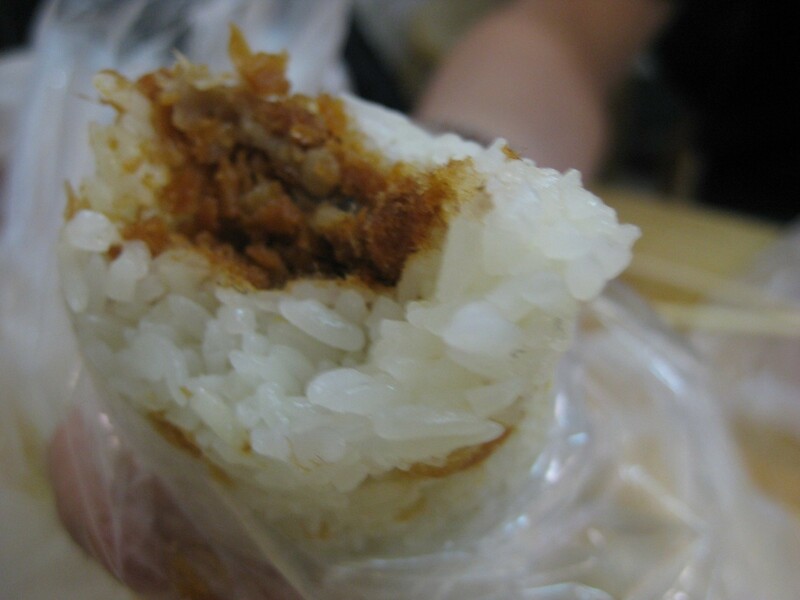 Breakfast rice roll (飯糰, fàn tuán). “Fire-pancake.” 燒餅, (shāo bĭng). Leek box (韭菜盒子, jiǔ cài hé zi). Hot soymilk (豆漿, dòu jiāng). This was one of the highlight meals of Taiwan, since it was a flashback to the Taiwanese breakfasts that my grandmother used to bring to the United States (at least what she could; the rest of the these Taiwanese goodies were obtained only though close approximations found in the United States). I/he agreed (for me) to meet him at his place, since there was a time-old location just a stone’s throw away from his grandparent’s place that served all the breakfast goodies under one roof. I was happy to oblige. 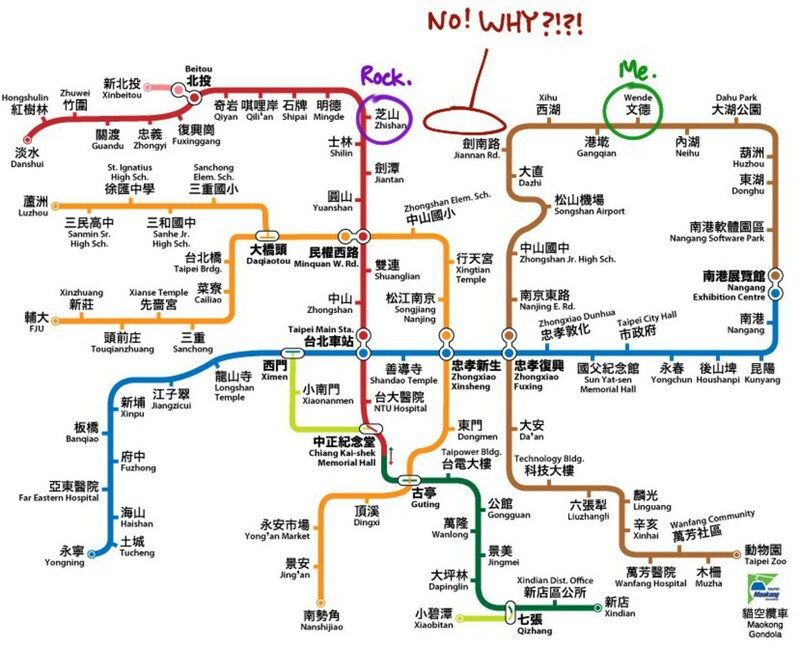 However, the thing about the Taiwanese MRT (subway) is that the straight line distance between our respective apartments was smack dab in the middle of an MRT dead-zone. This is labeled with much frustration in the map below. Thus, what would have been a quick 15 minute train ride evolved into a 40 minute horror-fest spanning three color transfers and a not so short walk up and down a couple hundred steps to get to his place. But no, I’m not complaining. As much as my feet protested, my stomach eventually had the executive decision, and I eventually made it to the hole-in-the-wall breakfast place. I say “breakfast place” because I honestly do not think this place had a name. It was probably known through the owner’s reputation from years of churning out tasty, fast breakfasts. The turnip/daikon cake is a Chinese classic that’s made by grating daikon or turnip, adding rice flour and/or cornstarch into a block that is steamed and then pan-fried before serving. The end-product is usually soft and springy, and packs a nice savory flavor. Additional ingredients for savory notes can also be added to enhance the cake, but usually the original flavor is sufficient. Rice flour usually gets the binding job done nicely, since when steamed, it causes the gelatinization of starch, which gives it an almost jello-like consistency. When warm and topped off with some thick soy sauce, you can’t just have one. Egg crepe. This basically is what it sounds like. Egg wrapped in a crepe like pocket, sometimes with scallions, sometimes without. Chinese version of a super-simple breakfast burrito. It’s rather simple. Crepe on a drink lid. Crullers. These are basically deep-fried lengths of dough that can be eaten alone with soy sauce, wrapped in the breakfast rice roll, or dipped in soymilk. Since the dough is relatively unflavored and presented individually in such a small volume, the cruller takes well to dipping in other heavily flavored things. If not dipped, they provide a satisfactory crunch and a source of fat to liven up other bland foods. 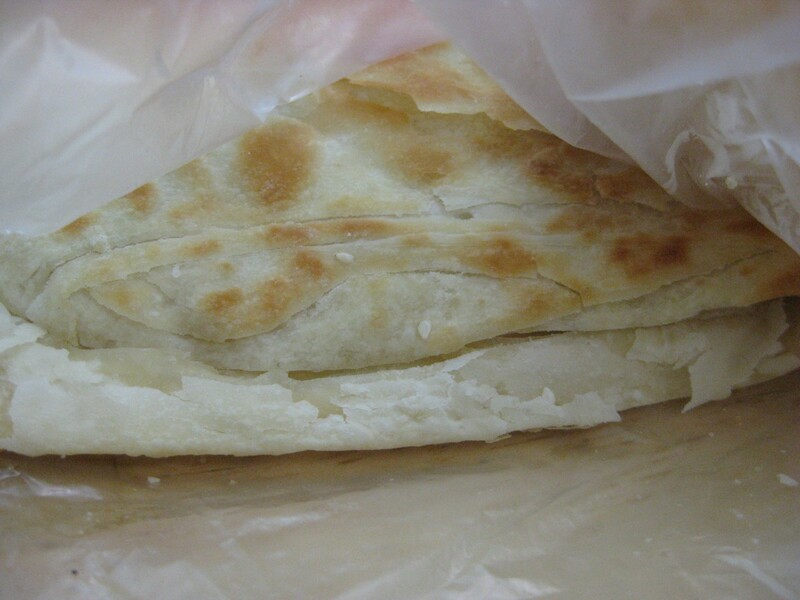 Shāo bĭng, is a layered, flaky, slightly savory bread baked with sesame seeds and served piping hot. To me it’s a bit bland, (unless it’s the thick kind with a massive amount of sesame seeds) but I think some of the charm of this breakfast item comes from the fact that its crispy, flaky, and slightly neutral. For those who don’t like heavy flavors for breakfast, this is your gig. Leek box. This literal Chinese-English translation was pretty hilarious. Technically it’s just a large dumpling/potsticker that’s cooked by a combination of browning and steaming. 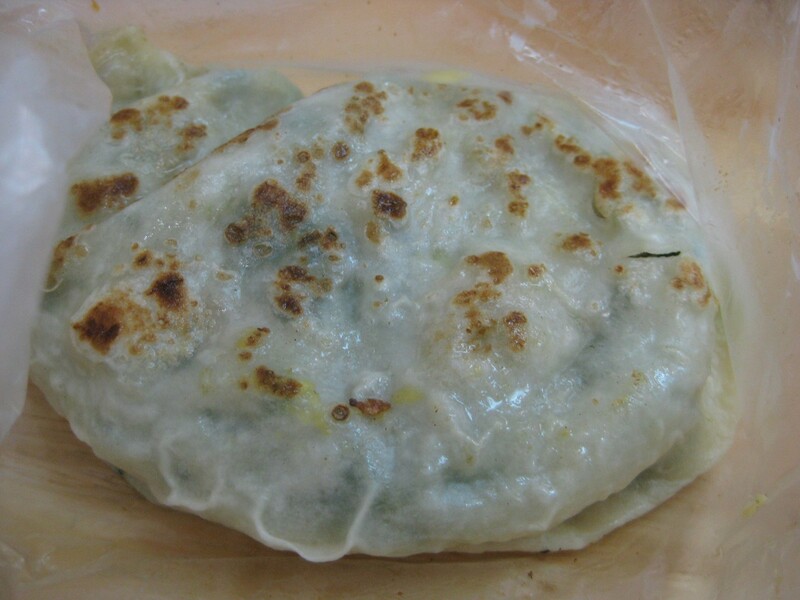 The inside usually contains finely chopped leek, mushrooms, bits of mung bean noodle, and sometimes, but rarely, some form of meat. Some oil is added to a pan, and the bottom/top is browned first, some water is thrown in and the contraption is lidded until piping hot. The lid is removed, the water is evaporated, the leek box is browned a bit more, and then served. Box? More like a pocket. Breakfast rice roll. Exactly as is described. Pickled cabbage, dried shredded meat wool, and crullers tightly packed in glutinous sticky rice. The whole concoction is wrapped in plastic and eaten like a burrito. The respective flavor profile is actually well-constructed. The shredded meat provides a large amount of body once your saliva hits it, and it doesn’t require much physical processing. Once your saliva hits the “meat wool” (that’s kind of what it is), it turns much more dense. This is combined with pickled cabbage for some acid, and a cruller for some fatty crunch. Rolled up in glutinous rice, and the whole thing is a wrap. Meat wool or (肉鬆, ròu sōng), in my opinion, deserves a bit of a scientific explanation. The most common forms of meat we usually encounter are found in its more pure form. Steaks, ribs, chops, loins, etc. Treating these piece of meat into a beautifully prepared main course would do it proper respect. Pickling and drying meat to turn it into jerky can also be a legitimate way to treat meat. But meal wool? How does something like this go about happening? The process of producing meat wool goes like this. Source: Mother. Pork is stewed with soy sauce until it is extremely tender. The pork is shredded. Large amounts of lard are subsequently rendered/added (if not enough), and the concoction is cooked further. The pork is then strained and dried in the oven. Meat wool has then been formed. Further dry cooking with a mashing action may occur if finer wool is desired. Pack. Express ship to my address. I was curious as to why the step with lard/rendered fat was actually included; pork wool is at its most basic composition, dried meat. If we simply dry meat, we end up with jerky. Even if we mash up jerky, the meat wool formed from mashing up jerky does not negate the toughness that would persist. I figured out that a large amount of oil not only allows greater evaporation of water, but crisps up the shredded meat. The fact that oil is more effective as a heat transfer method than water confers proteins that are more heat-damaged. Heat-damaged proteins possess more denatured states, hence the ability of proteins to scrunch up like wool. Meat wool. Who would’ve thought? A great article about meat wool. Another source, “Chinese Gastronomy,” by Tsiang Ju Lin has his own recipe, but I was unable to locate it.